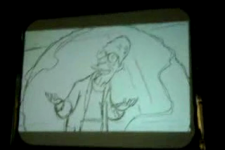 The first three minutes of the animatic of "Rebirth" were shown at Animation SuperCon in Florida on 4 October, 2009. The animatic shows the opening scene. The episode starts with a scene of Hypnotoad, then it cuts to the exterior of Planet Express. Professor Farnsworth is working on some sort of experiment in the dome of the Planet Express building, when Fry enters. He notes that he has severe burns, but does not remember why. The Professor then recalls what happened, telling the story to Fry. At the end of Into the Wild Green Yonder, according to the Professor, Zapp Brannigan chased the Planet Express crew (Fry, Leela, Bender, Professor Farnsworth, Hermes, Amy, Zoidberg, Scruffy, LaBarbara and Kif) to a wormhole which then they decided to go into, after Fry and Leela kiss when she admits her love for Fry, and upon appearing on the other side, they found themselves right in front of Earth. At the time, the Professor realised it was the "Panama Wormhole," a channel used for shipping. Zoidberg comments about the humor in the situation, followed by the Professor noting it as a "Comedy Central Channel" that they are currently on. While trying to return to Earth, Zapp's ship, the Nimbus, also exits the wormhole, and manages to damage the Planet Express Ship's engines. The Planet Express Ship then tries to make an emergency landing, but crashes head first into the ground outside of the Planet Express building, and explodes. Before the crash, the Professor activates everyone's "safety spheres", which seemingly protect a person from any external harm. The Professor has a full body safety sphere, while everyone else's only protect their heads. The Nimbus then crashes into the ground in the exact same spot as the Planet Express Ship. This ends the Professor's explanation, and he then shows Fry what remains of the rest of the crew and Zapp. All of their lifeless heads are orderly hung by hangers on a long bar, with their skeletons dangling beneath them. Fry screams in horror, and then it cuts to the title sequence. In the animatic, the professor is seen dropping something into a test tube. In the final copy, it is known he drops a fly caught by some tweezers. In the animatic, Fry's first line is, "Professor, my hair's all frizzy." In the final copy, his first line is the tongue-twisting, "Professor, my Fry-fro's all frizzy." In the animatic, Zapp similes while saying "open a hailing frequency for my victory yodel". In the animatic, Kif and Amy hear Zapp's yodel. In the final copy, it is seen the voice is heard from a loudspeaker. In the animatic, a generic announcer played by Maurice LaMarche says the very first line. In the final copy, Bender says it. This page was last edited on 2 March 2012, at 20:12.